Replacing noodles with Cauliflower for a delicious, super low carb, healthy meal! Replacing noodles with Cauliflower for a delicious, super low carb, healthy meal! Be generous with the cheese! You can also add celery or swap it for the broccoli. Boil a pot of water and add the cauliflower and broccoli. Cover and lower heat to simmer for 10 min. or until al dente. Then drain the water. 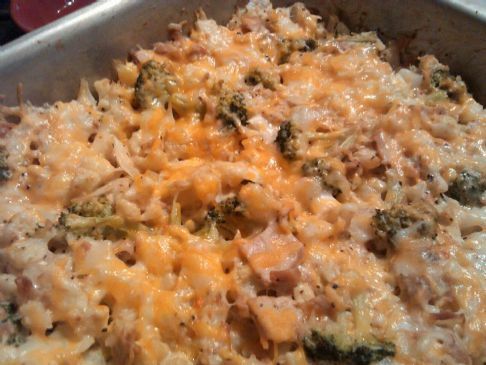 Mix all the ingredients (minus the separated 0.5 cups of cheese) together and spread in a large ungreased casserole dish. Sprinkle the withheld cheese on top. Bake for 30 min. or until bubbling.